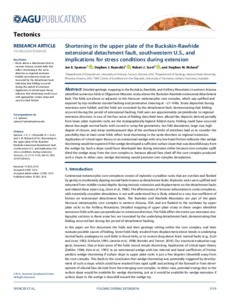 Detailed geologic mapping in the Buckskin, Rawhide, and Artillery Mountains in western Arizona identified numerous folds in Oligocene-Miocene strata above the Buckskin-Rawhide extensional detachment fault. The folds are above or adjacent to the Harcuvar metamorphic core complex, which was uplifted and exposed by top-northeast normal faulting and penetrative shearing at ~27-9Ma. Strata deposited during extension were folded, and the folds are truncated by the detachment fault, demonstrating that folding occurred during the period of extensional faulting. Fold axes are approximately perpendicular to regional extension direction. In two of the four areas of folding described here, alluvial-fan deposits derived partially from lower plate mylonitic rocks are the stratigraphically highest folded strata. Folding could have occurred above low-angle normal faults with curved or ramp-flat geometries, but fold abundance, large size, high degree of closure, and steep northeastward dips of the northeast limbs of anticlines lead us to consider the possibility that at least some folds reflect local shortening in the same direction as regional extension. Application of critical-taper theory to an extensional wedge with very low basal friction indicates that wedge shortening would be expected if the wedge developed a sufficient surface slope that was downhill away from the wedge tip. Such a slope could have developed late during extension either because core-complex uplift tilted the wedge away from the core complex or because alluvial fans shed off the core complex produced such a slope. In either case, wedge shortening would promote core-complex denudation.